This smudge burner is carved from pure Minnesota Catlinite, the material most commonly used for making pipe bowls. This smudge burner is carved from pure Minnesota Catlinite, the material most commonly used for making pipe bowls. Catlinite is also known as Pipestone. These work very nicely for burning small quantities of herbs, with a smudging area that is approximately 2.25" in diameter and 3/8" deep. Outer dimensions are varied due to shape of Catlinite used. These burners are the PERFECT size to take with you on your journeys. Sending up prayers in smoke, in the outdoors, is a wonderful way to connect to the Great Spirit... and to yourself. "At an ancient time the Great Spirit, in the form of a large bird, stood upon the wall of rock and called all the tribes around him. Taking out a piece of the red stone, he formed it into a pipe and smoked it, the smoke rolling over the whole multitude. He then told his red children that this red stone was their flesh, that they were made from it, that they must all smoke to him through it, that they must use it for nothing but pipes: and as it belonged alike to all the tribes, the ground was sacred, and no weapons must be used or brought upon it." 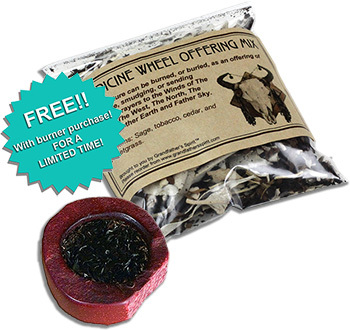 For a limited time, receive a FREE 1/2 ounce of Medicine Wheel Offering Mix with the purchase of this burner!